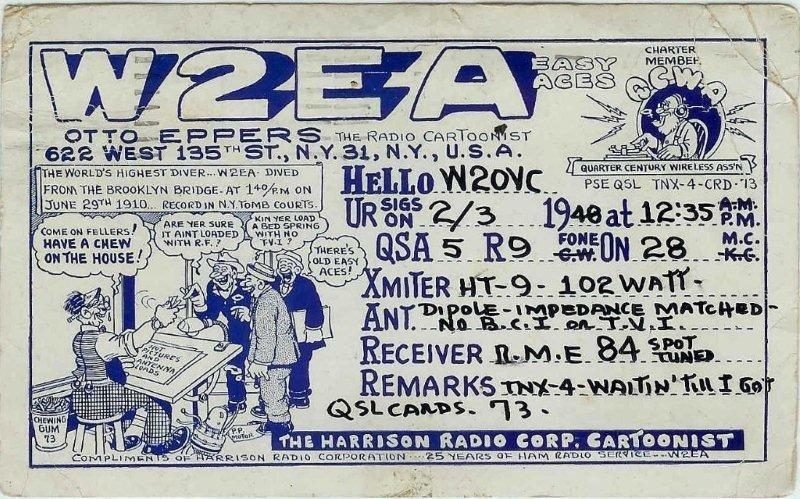 The story of ham radio’s high-diving QSL cartoonist. In the early half of the 20th century ham radio was just coming into its own. During these early years there were many colorful personalities who contributed their talents and interests to the field. But one in particular is a standout and not just for his radio contributions. He bore the curious name of Otto Eppers and his work lives on today. Otto was known for his generosity, civic commitment, sense of humor and most notably his artistic ability. 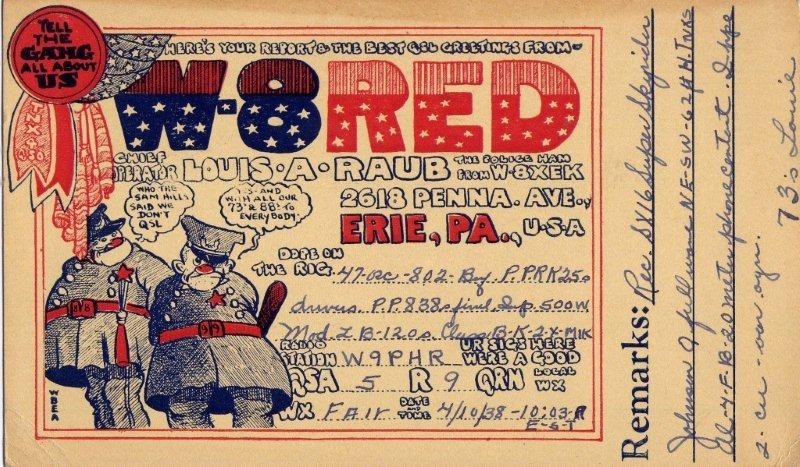 His QSL cards are valuable collector’s items today and are treasured by many of his admirers. But what many of his friends of the day were unaware of was Otto’s adventurous spirit. This young daredevil is credited with the first witnessed successful jump from New York’s Brooklyn Bridge. As a teenager he dreamed of a career in cartooning. He exhibited talent as a nascent artist and enjoyed creating caricatures. But he was practical enough to recognize that talent alone would not earn him even an entry level job in his chosen field. He would need money for lessons and public fame to jump start his career. And he would do that with a splash — literally. Where Otto came upon the notion of diving off a New York bridge is anyone’s guess. Clearly his family was unaware of his plans. Otto believed that such a publicity stunt could be turned into hard cash. So he and a Brooklyn clothier, Harry Dressler, agreed to a wild scheme. If Otto could jump off one of the bridges and survive, Harry would pay him $250 and provide him with two brand new suits of his choosing. But this was far from a sure thing. 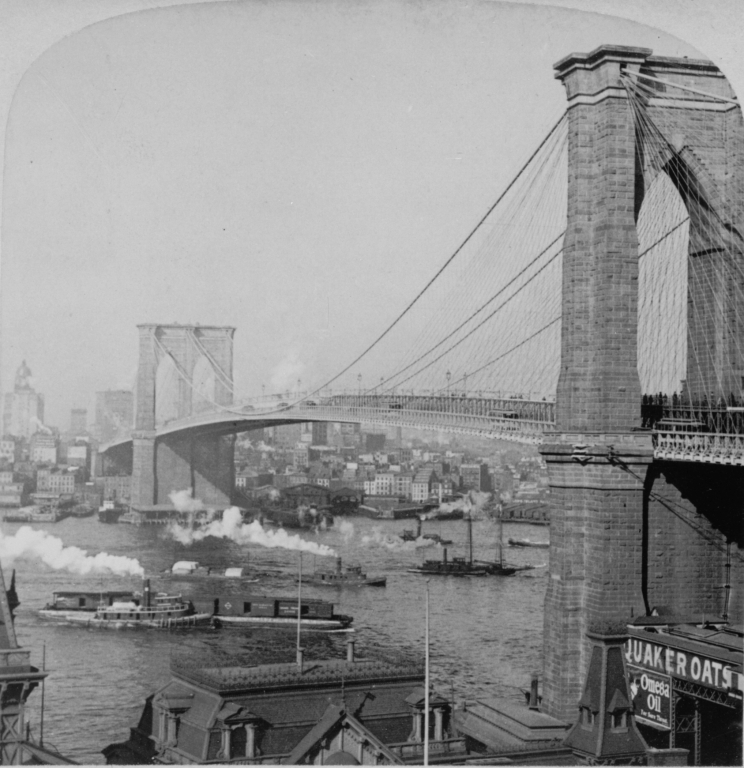 Over the years, scores of suicide attempts had been carried out from the New York bridges, particularly the Brooklyn. The great majority were successful, if that is the correct use of the term. A handful of unlucky jumpers did survive their ordeal but they were often badly maimed or suffered serious internal injuries. So the track record for jumpers was dismal at best. Nevertheless, about 1 in the afternoon of June 29, Otto left his home accompanied by three accomplices in a newfangled motor car. Otto’s immediate destination was the Manhattan Bridge, the nearby younger cousin of the Brooklyn Bridge. But things were not going as planned. The New York City police had been tipped off the day before about a jump attempt. They positioned officers on bicycles along the Manhattan’s roadway to thwart any would-be jumpers. Otto and his entourage quickly recognized the heightened police presence and they decided to continue over to the island of Manhattan and recross back to Brooklyn via the bridge of the same name. As the auto reached mid span of the Brooklyn Bridge, Otto ordered the driver to stop the vehicle so he could shed his overcoat, trousers and boots. But the stalled auto caught the attention of Patrolman Scheffmeyer, stationed on the Brooklyn-bound lanes. Otto scrambled through the latticework of the superstructure with Patrolman Scheffmeyer in hot pursuit. The river flowed about 135 feet below, the equivalent of dropping off a 14 story building. Still fully dressed, Otto raised his hands over his head and hurriedly pushed off the steel structure. His intention was to dive in one long, sweeping arc. That didn’t happen. “But somehow I started to twist, and then I couldn’t stop” he later told reporters. Spectators lining the river’s edge described him turning three or four pinwheels before he entered the water in a sitting position. “I wasn’t a bit scared until I jumped, but I don’t remember anything after I hit until I came up.” He remained submerged for some 15 seconds after impact. The tug made for the Brooklyn shore where the awaiting police were quick to arrest him. The charge — attempted suicide. Addressing no one in particular Appelton said “Well, he seems very much alive, doesn’t he?” The charges were dropped due to lack of evidence. Otto walked out of the courtroom but received a stern upbraiding from his mother and sister. 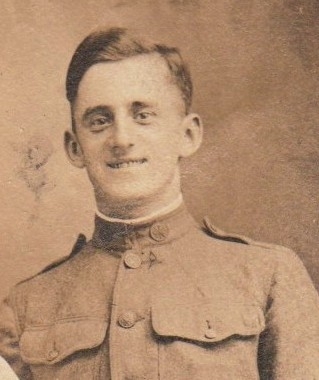 Otto next left New York, enlisted in the Army and was stationed in Little Silver, New Jersey. His duties included being a motorcycle dispatch rider for the Signal Operation and Engineer’s Division. 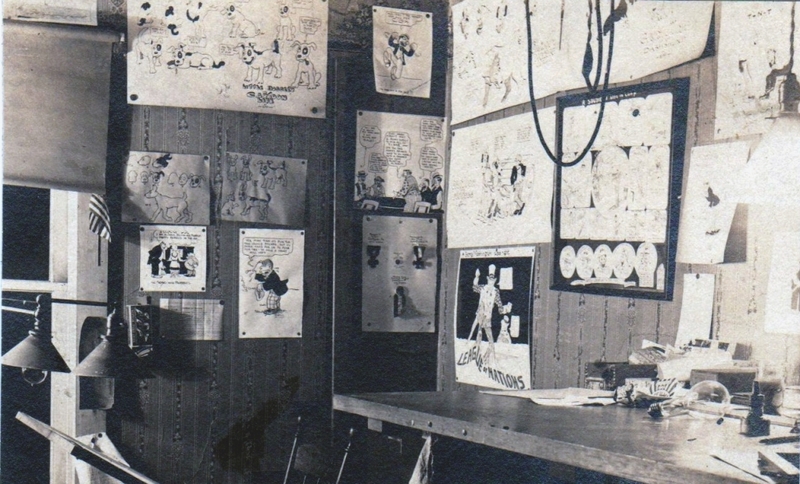 During his enlistment, Otto cultivated a greater interest in cartoon drawing. He furnished “very creditable cartoons” for the base’s newspaper. He also became adept in early radio operation. Both of these interests would have major influences on his life and career. Now is your chance to see something for your money, let Otto shine your shoes and if the shine don’t prove to be the best shine in this town, then it won’t cost you a cent. Otto, the King of the Bootblacks. Down in the Dimeling Barber Shop. His reign as King lasted only a few short years. In 1919, the people of Clearfield saw in Otto a “great deal of mechanical and artistic skill with brush and pencil.” With the encouragement and financial assistance of 25 Clearfield residents, Otto was persuaded to close his shoeshine business and take up serious study in cartooning. He enrolled in a correspondence course in one of the leading schools for cartooning at the time. But radio operation was also close to his heart. His connection with the Dimeling Hotel through his shoeshine business would prove to be very useful. Combining his interest in ham radio with the availability of a station within the hotel would be beneficial for both parties. He became Clearfield’s most popular ham radio operator in the ’20s and ’30s. Otto operated W8DIK, the call letters for the Dimeling Hotel and his own station W8EA from his home. It was from W8EA that he broadcast updates of the 1936 flood, which devastated the town.1 He is credited with providing up-to-date information to all of the valley’s residents during this damaging storm. But it was in the 1920s that Otto was truly able to flourish. 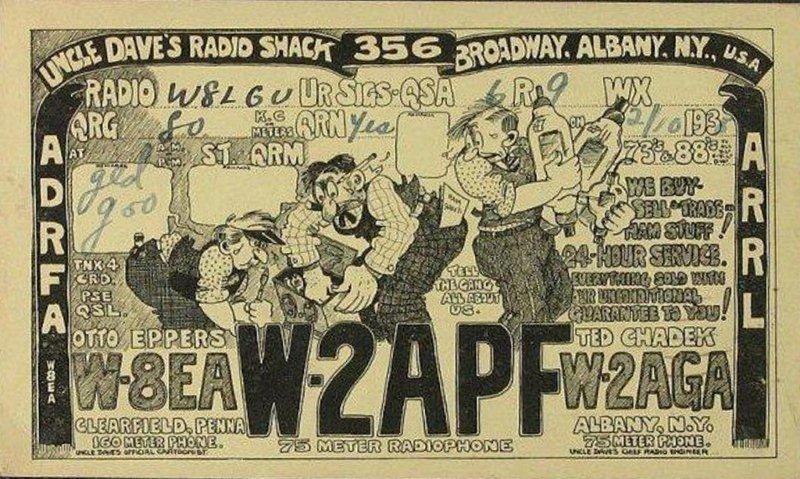 He successfully merged his artistic talents and radio interest by creating some unique QSL cards that defined the era. Otto also continued to support ham radio in many other ways. 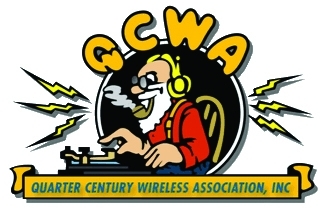 In 1947 he became one the original members of the Quarter Century Wireless Association. He designed their logo, which continues in use today. MUST SELL AT ONCE-Otto Eppers is leaving town and will sacrifice everything, his home, fully equipped to give you right from the start a 7 room house…All the coal for the winter, 2 fully equipped bedrooms, with all the extra bedding. Living room, Grandfather’s clock, kitchen fully equipped with dishes, silverware, all the groceries, canned goods, including butter (emphasis added)…all valued at $6,800.00 which must be sold to the first cash buyer. Only spot cash buyers will be welcomed. Here is your chance. I am called out of town for special work and can’t take a thing with me. Look it over…$3,000 takes everything. He did indeed move to New York and finally had the career he had dreamt about a third of a century before. And he hit it big. He ended up in the employ of the cartoon giants Chester Publications, I.W. Publications and Marvel Comics. His work was captured in many comic book series, including Happy Landing, IMA Slooth, Punch and Cutey, Gunsmoke and Inspector Fumble. Although he missed Clearfield and the wonderful friendships he had established in his time there, these years in cartooning would prove to be some of Otto’s most enjoyable. Despite a late start to his illustration career he is today referenced in Who’s Who of American Comics. Sadly, Otto continued on for only a dozen more years and died in a New York Hospital 3 days short of Christmas, 1955. 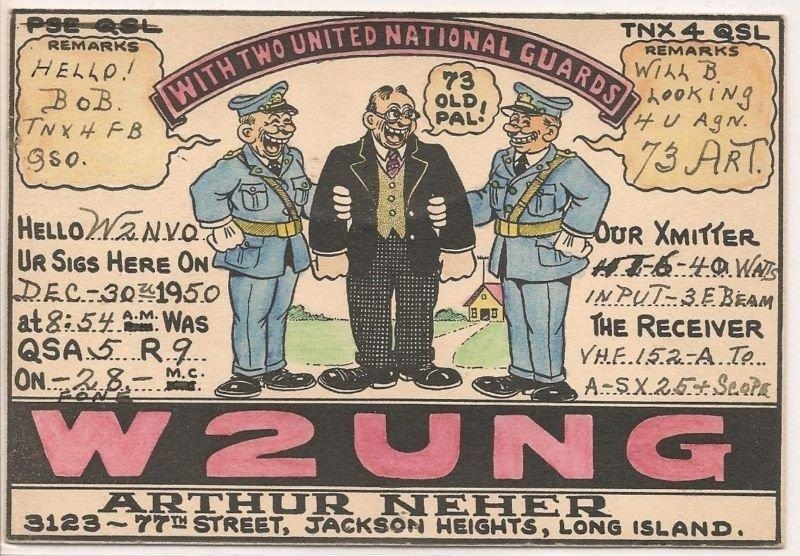 But Otto’s work lives on in the many QSL cards, various logos and his comic book illustrations. And whenever a reference to the Brooklyn Bridge is mentioned in history or modern day fireworks, a curiously named ham radio operator with a talent with pen and ink will always come to mind — Otto Eppers. Thomas Clark is a writer of history and science, including researching and writing about interesting individuals who take a path less well traveled. He has always enjoyed studying and constructing simple electronic devices and plans to continue to research ham radio history and early memorabilia. Tom can be reached at 3 Saddle Ridge Rd, Hohokus, NJ 07423. 1C. DeSoto, W1CBD, “Amateur Radio Rises to the Greatest Emergency Need of All Time,” QST, May 1936, pp 9-21, 112-122. Available online to members. 2C. Estes, W9FYM, “The Chair Warmer’s Club,” QST, Feb 1931, “The Communications Department,” p II. Available online to members.